Tracy McGrady Threatens To Leave China, Gets Suspended For Calling Refs "Three Blind Mice"
Why is Tracy McGrady still just 33 years old, when he should totally be in his late 40s? The second act of T-Mac's career is taking place in China, where last we heard, he was getting into fights and getting diarrhea and just generally not having a good time. Wednesday's game, where McGrady's Qingdao Double Star Eagles walked off the court in protest and forfeited, probably didn't help. Beijing Cream has your video and breakdown, but here's the gist: In a game where the teams combined to take 81 free throws, the refs simply missed the shot clock expiring on a crucial late possession. Bayi would hit a three, and Qingdao's coach will pull his players off the floor. 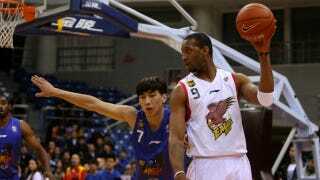 Afterward, McGrady took to Sina Weibo, the Facebook/Twitter of China, to express his displeasure. "CBA has to do a better job with these officials. My team plays hard every night and the 3 blind mice take it away from us! "This bad officiating has to change. No way I'm coming back if the officiating continues to be this errant." For what the CBA termed McGrady's "adverse social impact," he was suspended one game and fined about $1,600. The league must not have thought he was entirely in the wrong, though: it suspended the head referee for 10 games and his assistants for five.